Signed with a "P", possibly intertwined with a backward "C", below each handle. 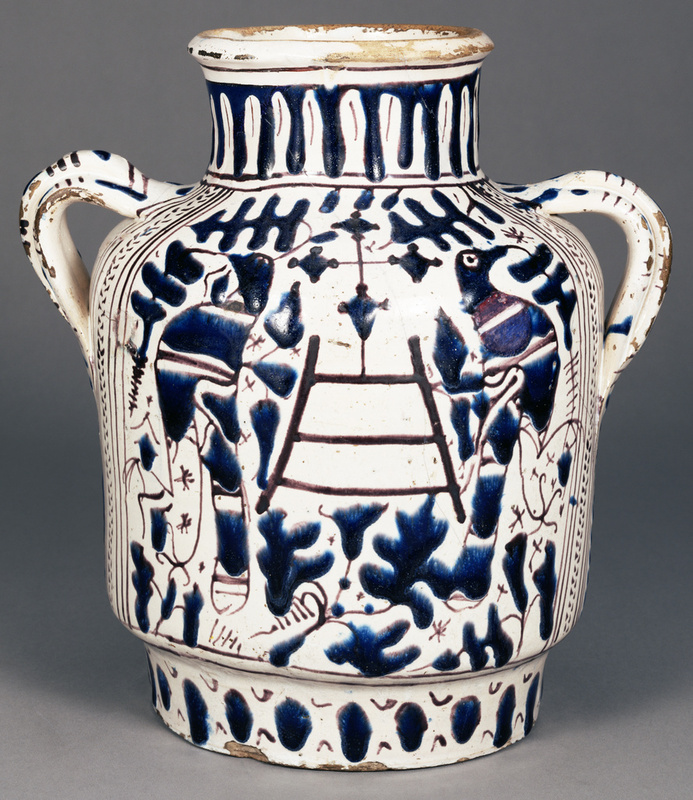 Inscription:On each side, a ladder surmounted by a cross; below each handle a P, possibly intertwined with a backward C.
This large, two-handled drug jar has an exceptionally rare shape and bold design. It was produced for the pharmacy of the Sienese hospital of Santa Maria della Scala, whose emblem-a three-runged ladder (scala a pioli) surmounted by a cross-appears on both sides. This emblem refers to the hospital's location in front of the steps (scale) of the city's cathedral. The emblem is framed on one side by two birds, possibly peacocks, and on the other by two human-faced birds, or harpies, who were monsters believed to torment misers in the fifteenth century. The surface is also decorated with stylized leaves and dots, which resemble oak leaves and berries. The decoration is painted in a very thick, cobalt-blue impasto, often called relief blue because it was applied so thickly that it seems to stand out from the vessel's surface. The leafy shapes are outlined in, and scattered with, touches of manganese purple. Under each handle is a letter P, possibly intertwined with a backward C, which may be the mark of the Florentine workshop of Piero di Mazeo. Wilhelm von Bode, 1845 - 1929 (Berlin, Germany), sold to Kurt Glogowski. August Lederer, 1857 - 1936 (Vienna, Austria), by inheritance to his widow, Serena Lederer, 1936. Serena Lederer, 1867 - 1943 (Bartensteingasse 8, Vienna I, Austria), confiscated by the Gestapo (at the direction of the Zentralstelle für Denkmalscuhtz), per the order of the Wiener Magistrat, Magistratsabteilung 2, dated November 26, 1938. Source: Archive of the Bundesdenkmalamt (BDA) – Archive, Box 9, Lederer 1940-1946, No. 1, p. 6, no. 182. In the possession of the Nazis, valued at 3,000 Reichsmarks and stored, by autumn 1939, at the Zentraldepot at Neue Burg, Vienna; moved to "R.B. Depot," meaning the Reichsbank (the Austrian National Bank), (Vienna I, Austria), March 30, 1942; evacuated to the salt mines at "Aussee" (Altausee, Austria), October 7, 1943; recovered by the US Forces (80th Infantry Division, Task Force Pearson), May 8, 1945. Source: Index card of the Nazi administration/Zentralstelle für Denkmalschutz, Lederer, Serena, number 182: "Grosser Albarello mit Blaumalerei und Wappen des Spitals delle Scala. Ca. 31 cm hoch." BDA-Archive, Restitutionsmaterialien, Karton 6/1, Mappe 58, fol.11. In custody of the Allied Forces, (salt mines at Altaussee, Austria), released to the Republic of Austria by December 1, 1947. Austrian government, restituted to the son of Serena Lederer, Erich Lederer.